Most people will use their iPhone to access the internet. The app used for that is Safari, which comes with many different features. Here is a complete rundown of Safari’s settings and feature options. Press the Home button, and then tap Settings➪Safari to display the Safari Settings screen. Search Engine: Tap and choose your preferred Search provider. Passwords &AutoFill: Tap to activate and adjust the AutoFill features. Favorites: Choose the folder that appears at the top of the Bookmarks list. Open Links: Tap this button to choose what you want Safari to do when you tap a link in a web page. 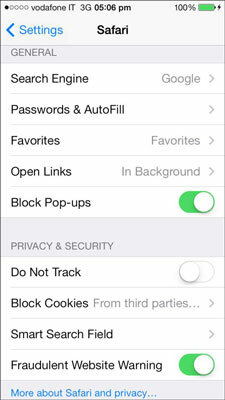 Block Pop-ups: When on, Safari does its best to block pop-up ads or solicitations. Do Not Track: When on, Safari asks websites that track data about you (ostensibly to offer you more tailored information when you visit their sites) to not track your activity. It’s a request, not a demand, so it is up to the website to respect your request or not. Block Cookies: Cookies are bits of information certain websites store, so those websites can know and remember certain things about you. Tap and choose whether you want to receive cookies Never, From Visited, or Always. From Visited is the choice it is recommended so that websites you go to can remember things like your ZIP code for giving you the weather forecast and so on. Choosing Never may result in some websites not functioning properly, and choosing Always also allows sites you didn’t visit but that appeared via pop-ups to grab and store information about your Internet activity. Smart Search Field: Tap to enable two options: Search Suggestions, which allows Safari to suggest matches to your search criteria based on what you type, and Preload Top Hit, which begins loading a web page in the background when a match is determined based on your bookmarks and browsing history. Fraudulent website Warning: Turn this on if you want Safari to warn you if what seems like a legitimate website you want to open may in fact be a potentially harmful site. Clear History, Clear Cookies and Data: Tapping either of these erases their respective saved files from your iPhone. Clear History wipes out Safari’s memory of any websites you visited. Clear Cookies and Data erases any crumbs of cookie information you may have typed in to certain websites, like your ZIP code. Use Cellular Data: Downloads articles to Reading List using your cellular data connection (when Wi-Fi isn’t available) so you can read them offline. If you’re concerned about your cellular data limits and consumption, turn this option off. Website Data: Tap to view any databases that are automatically created by certain websites so those websites can speed up your web browsing experience when you use them. You may see databases for , for instance, if you use Safari to read your e-mail. The list also displays how much space that database is taking up on your iPhone. Tapping Edit allows you to delete items one by one from the list, whereas tapping Remove All website Data at the bottom of the screen clears the list completely. Web Inspector: website developers turn on this feature to help them troubleshoot problems the web pages they create may run into. If you want to keep advertisers’ snooping eyes from gathering information about your web habits (to then offer you things they think you should buy from them), go to Settings➪Privacy➪Advertising, and then tap Limit Ad Tracking On.